At approximately 9 pm eastern on Tuesday, October 2, ten conservative Twitter accounts owned by ten different entities were suspended by the social media company. 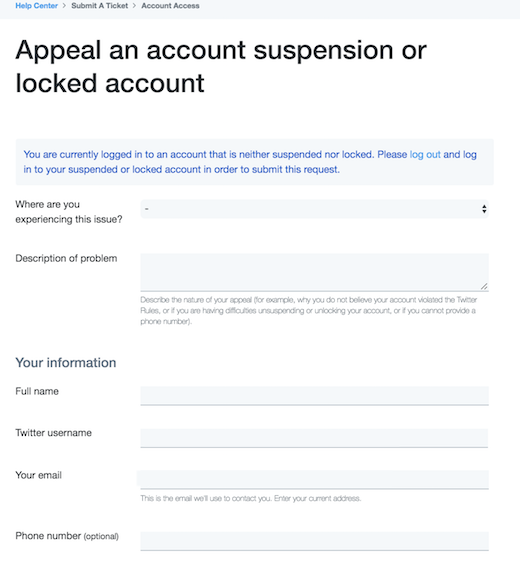 When the account owners contacted Twitter to get the details of what they supposedly did wrong and appeal the punishment, no reason was provided. Instead, the “bluebirds of punishment” sent them notices that they were permanently banned. The first seven of the accounts above had never received any warning or punishment by Twitter. The bottom three were suspended about six years ago but never received any warning that they were close to being in trouble. Read the email carefully. Do you notice that after the support team email says “Specifically, for” there is a blank space? 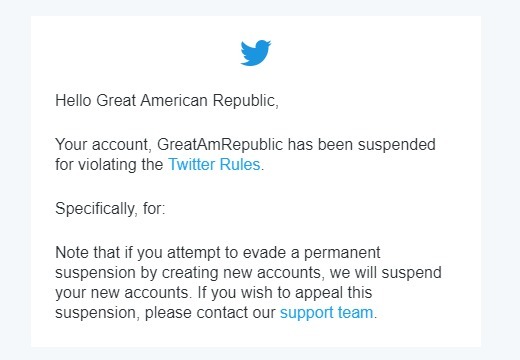 In other words, they were suspended for violating Twitter rules but apparently, which particular rules are not for their consumption. Perhaps those roles are kept a safe with the formula for Coca-Cola, and Col. Sanders chicken recipe. None of the accounts or the websites are particularly controversial. Perhaps Twitter wouldn’t tell them why they were banned because the only Twitter rule violated was breathing oxygen while conservative. The email from the bluebirds of punishment says “repeat violations.” How can they expect people not to repeat violations if they weren’t told what the violations were in the first place? Here’s the real truth, they didn’t have time to repeat. 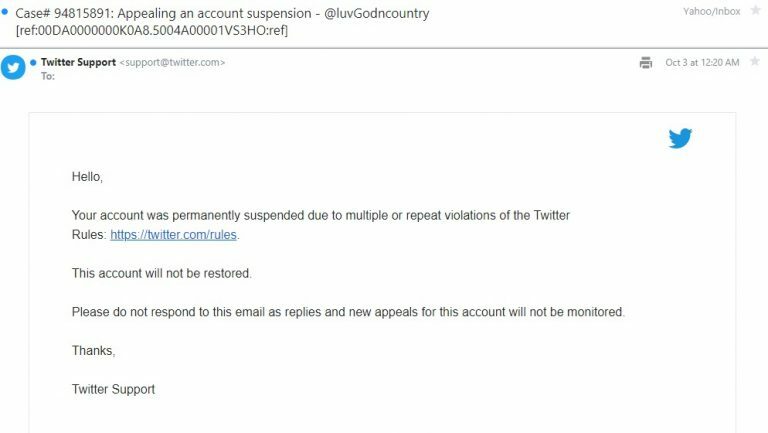 The person who owns @luvGodnCountry told me that as soon as she received the suspension notice, she appealed. Precisely four seconds after she filled out the form below and sent it to Twitter the second notice appeared telling her that she was forever banned. Four seconds. Which indicates to us that the response was automated. Ms. Fair was suspended from Twitter…not permanently. Do you want to be fed only one side of each story? With censorship like this, Jack Dorsey’s social media company is controlling the information you get, preventing you from making your own intelligent decision by limiting the data you have to consider. Everyone, both conservative or liberal, should be concerned. It’s like the novel 1984. Twitter (and Facebook too) is acting like Oceania, in this case, ruled by liberalism. They have become like the “Thought Police,” persecuting anyone who exhibits independent thinking outside their particular point of view. Don’t start screaming about the First Amendment as they are privately owned and aren’t beholden to those free speech provisions. In a sentence, social media websites are simply private businesses that are engaging in contracts and yes, they can be held liable for tortious conduct like breach of contract, fraudulent inducement, unjust enrichment, intentional infliction of emotional distress, bad faith, and unfair dealing, as I first noted here. Right now, people who are being censored on Facebook feel powerless because it is too expensive to sue big social media companies, companies which, I might add, have limitless resources, even though they could. Plus, it is extremely difficult, if not downright impossible, to calculate damages, and also, it is unclear who would prevail because of the terms and conditions set by the social media website that were agreed upon when the user signed up. While Sevier focused on Facebook in the snippet above, the same applies to Twitter, which would be covered under the measure he proposed and is being considered by lawmakers in various states. Hey Jack, do you know why people don’t believe you? Because it’s not true! And the ten accounts your people booted out of Twitter on Tuesday is proof. Liberals might ask “why should I care?” Well, my big government friends, one day a conservative will invent the next big social media thing. And you will be the censored ones. You will have to work twice as hard to promote your websites or have a conversation with a friend from a distant country outside America (like California). You will have to work harder because while the facts you present are truthful, the opinions expressed do not agree with the social media’s senior management. Most of the above was cross-posted with The Lid.